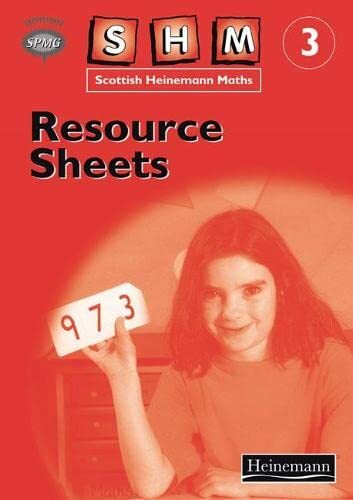 "Scottish Heinemann Maths" offers flexible and easy-to-manage ways to plan lessons and a programme of work that reflects the key recommendations of the HMI report "Improving Mathematics Education 5-14". The "Organising and Planning Guide" gives the rationale and ethos of SHM, linking the component parts and advising on planning. A customisable CD at each stage gives 5-14 levelled planning and a weekly planning template. The "Teaching File" provides easy to follow instructions for each lesson. Lessons begin with lively mental activities, followed by a broad range of interactive teaching activities. Structured pupil activities consolidate, reinforce and extend topics, and there are clear suggestions for follow-ups to the main points of the lesson. The progression through each topic is carefully structured to provide a balance of oral and practical work. SHM has pupil resources that are clear, fun and easy to use. Activity books are used for SHM1-4, textbooks and extension textbooks for SHM3-7. A flexible strategy helps teachers monitor pupil progress and inform lesson planning. It offers a three-strand approach to assessment - ongoing (at the end of small blocks of work), assessment for specific topics and longer-term, end-of-level assessment. SHM has been purposefully written to help children achieve a higher standard of attainment. It provides a fast pace of learning and uses a direct, interactive method of teaching, placing considerable emphasis on oral and mental mathematics.